It's coming up to that time of year again when we celebrate the foiling of the gunpowder plot by burning effigies on bonfires and with brightly coloured fireworks. Green Lane Primary School has been the first off the mark with what they have termed a ‘Fireworks Spectacular’ on Friday the 8th November. 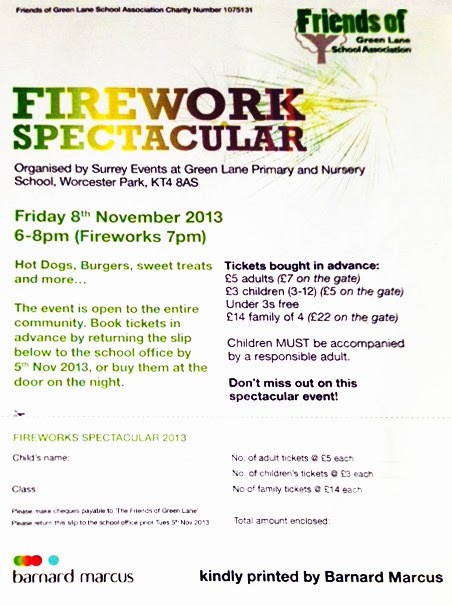 Organised by Surrey Events, the event which is open to the entire community, starts at 6pm with hot dogs, burgers, sweet, treats and more and finished at 8pm. The actual fireworks begin at 7pm. Email office@glp.rbksch.org to book tickets in advance at the cheaper rate. Children must be accompanied by a responsible adult!